It's actually all detailed in another post. Thanks for the link Garry, much appreciated. Onieda http://www.oneida-air.com/ look under Dust Deputy accessories they sell anti staic fittings, including 90 degree and hose. Thanks rst, that would be great if the size would fit. Can someone please measure the OD an ID of the CMS fence dust port. 44mm ID / 49-54mm OD on the tapered end. The standard 36mm hose end (487721 - D 36 DM-AS Reducing Sleeve) fits perfectly inside the elbow's tapered end. The fittings will work, they are the same ones used with the Dust Deputy, just leave the original Festool end on. Great idea, however I have the CMS/VL and I don't think it will work. I am so frustrated with the CMS fence I could scream. Ya it's a dead horse topic but I gotta vent. The product website says it's "New". Hmmmmm it looks just like my 2 year old version. Considering all the innovative, exacting products Festool makes, one would think they could make a router fence that doesn't take 30 minutes to set up for 5 minutes of routing...... Like it did today. Sorry for the logic attack. Looks like I'm going to bite the bullet and take the Incra LS route. Heck a new version of the CMS fence would probably be twice as much. @iamnothim I would have thought you'd have gone with the Precision Plate for the Incra years ago .. did you have a change of heart? That's a creative good solution but I'm an all or nothing guy. I would have thought you'd have gone with the Precision Plate for the Incra years ago .. did you have a change of heart? Ya. It's all about what's in the "Leather" I was searching yesterday for that "thingy" and couldn't find it. Thanks for posting the name. (Precision Plate) Man I want one real bad. It's crazy how sloppy the CMS fence is. Very Un-Festool. Decided to revive this thread rather than start another. Gives those who have not seen this thread an opportunity to see it and keeps the improvements in one place. Wanted a way to adjust the fence without having turn the hand wheel so much. Eventually I will add the micro adjust, just have to figure out how. Repurposed a couple of the parts from some extra angle heads I had laying around. Original drilling for WP micro adjust. Never installed it, decided to go a different route. UHMW tape, creates a glide surface. Had to relieve the bar to accept the jamb nut. Piece of perforated angle iron to align the struts. Installed, I'm going to get a couple of acorn nuts to cover the ends of the threaded rod. Not owning the CMS GE just yet I've been speculating about the issue with the Fence, I'd thought about something that looks like what you created would be a good solution. And now you've done it. I will give this idea a try in the next few months..
Use a Fastcap Kapex table mount (http://www.fastcap.com/estore/pc/viewPrd.asp?idproduct=54411) to attach 2 feet of Fastcap Best Fence (http://www.fastcap.com/estore/pc/viewprd.asp?idproduct=42614). Then attach an Incra LS Positioner with a Wonderfence ( http://incra.com/router_table_fences-ls_super_sys.html) to what is effectively an extension of the CMS table. That will be further supported by a Fastcap Upper Hand, which is essentially a collapsible leg. As long as you can get the positioner attached somehow and not have to move it you'll be golden. I have the incra rails on my mafell Erika and made a router leaf for it. The micro adjust ability of the fence is so useful for routing and the wonder fence is a great addition also with the split rail for dust collection. You won't be disappointed at all. I'm looking at this and it seems to me the CMS GE and the Incra positioner super fence gets a little to bulky, If I need the Incra positioner and it to be portable, I think I would just make my own table for it built from the ground up to be a portable Incra setup.. It's important to me to be able to break the whole thing down when not in use. In my approach, the legs come apart and collapse to a small package, easily stowed, and the positioner either pops right off the table extension or the table extension unhooks from the CMS. Either way, the pieces should be easy to hang from a wall, out of the way. Each of the pieces is designed to work that way so I figured it might be more secure and easier to take apart than what I could come up with. I had a design for a permanent addition to the table, but the Incra positioner makes the whole apparatus too large for my shop area. I can see the logic then in a fixed location, it's easy to just stow things up out of the way, high on a wall. I'm going to moving to different locations, so I'd be a little concerned about taking the delicate looking Incra position out from place to place. To Bad Festool doesn't meet the need and come up with a more compact fence but with some of the Incra features, perhaps making it work together with the sliding side fence. Thank you for the great idea Benjamin! Just finished up setting my CMS with the WP micro adjust. It works amazingly well. Such an improvement. -I tapped holes in the crown stop so that the bolts thread directly to it. -I also tapped the back of the fence for the long 6" bolts to attach to. -I used a 1-1/2" Fernco rubber 90 deg to slip over the back of the fence port and hose end. It's a perfect fit. For an extra $100 or so, it makes a lot of sense to do this mod. Just saw your project. Great idea. I have also looked at the Woodpecker micro adjuster. Very versatile. Great use of the Woodpeckers adjuster and realizing that the crown stop would work for attaching it to the table. I really need to learn to download and attach pictures...I attached two CMS-VLs together with a section between that I put tee slots in so I could move the Woodpecker in and out and use it on either side. Again my apologies for the teaser, I've been asked numerous times for pictures, it's just that lack of learning curve time has prevented my sharing. Did you ever impliment your other idea? How does the angle heads actually attach to the fence here? Did you find a way to incorporate the micro adjust? The arms from the angle head attach to the fence, the head itself does not. The head attaches to the v-grove as it normally would. I believe so, work keeps getting in the way of working on the solution. Again--thanks to Benjamin for the inspiration. This is my take 2, stoled more of Bens idea. What I did not like about my mod was the clunkiness of the moment. Never did get around to trying a rack and pinion. What I did not like about Bens system was the lack of coarse adjustment. I square the fence using the TSO MTR off the edge of the table. A little more effort and I probably could have fit the adjuster to the channels better to keep it square. I believe I've solved both issues. Rough adjustment and fine adjustment. Fast movement of fence with the fine adjust. Many thanks for these post on using the Woodpecker micro adjust with the CMS. I was looking for a way to make fine adjustment in the fence on my CMS Router. So I have come up with this set up. I still need to finish the 2 inch aluminum channel ,and install the adjustment knobs. I used a similar system for my dual CMS setup. I’ve found that if you remove the tool end cuff from the 36mm gray hose, the hose will plug into the back of the fence without the need for adapters on my set up. 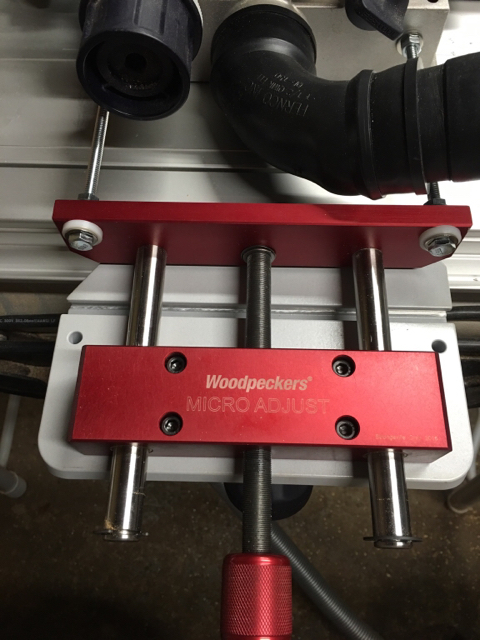 I am now thinking about just installing threaded inserts in the extension table to secure the Woodpecker unit to the table. I think I will only need these inserts in two locations back from the router head. But this system would take more time to move out of the way to acces the router bit. I have found, most times I can move the sliding fence out and access the bit. It’s pretty rare I have to move the fence back to change the bit. 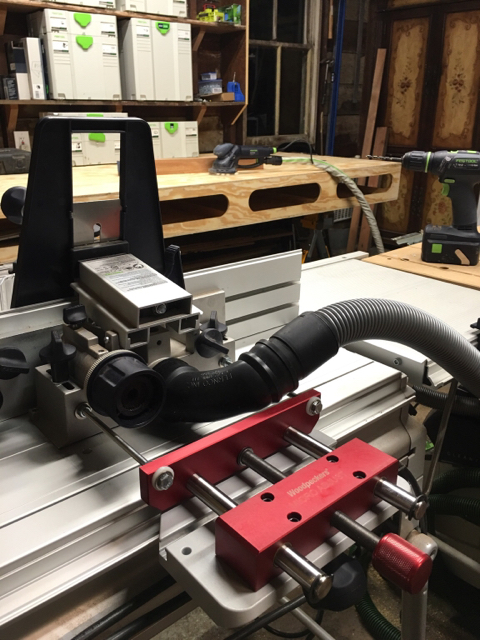 New set up using festool parts? ?